Nestled in the hillside of the northern section of Escondido, just 18 miles from the California coastline, is the picturesque community of Canyon Grove. Adjacent to 3,150 acres of pristine conservation land at historic Daley Ranch, Canyon Grove feels like a peaceful retreat—yet, with easy access to I-15, and just a short distance from the businesses, retail, and restaurants of San Diego. 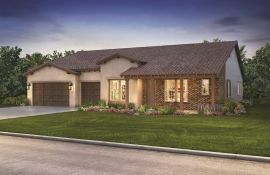 The Estates at Canyon Grove offers one- and two-story new homes for sale, with floorplans ranging from approximately 2,894 to 4,115 square feet with and three to six bedrooms. These stunning new homes for sale feature open-concept living spaces, well-appointed kitchens, three- to five-car garages, and folding glass doors leading to covered outdoor patios. Expansive lots offer plenty of room to spread out and enjoy the year-round gorgeous weather of Escondido. As an added bonus, Canyon Grove has no Mello Roos associated with our homes for sale.